The view driving my daughter to school yesterday. The clear ruts were deceiving because although they looked clear, they were icy. My round-trip commute of about 10 miles took one hour, ten minutes. It really looks so very cold!... and dangerous too! You musta sure wanted to make sure she got to school. Well, you got your snow. Unfortunately you got your ice, too. The ice is no fun! 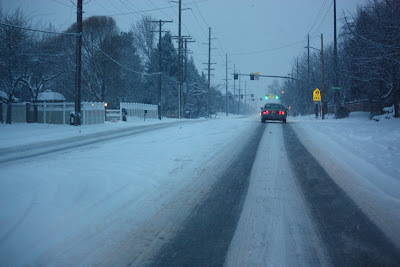 I prefer snowpacked roads, really fun to drive on. Referring to your comment left on my blog: I completely agree with you. Idleness is not a thing to have as part of one's personality and daily life. It can really pull you away from where you should be with God. If that happened here, they'd lock the school up til the roads were clear! No school what so ever when there's barely a hint of snow or ice! It's pretty ridiculous at times!!! I remember as a kid, we usually had to go to school, even on town-kid-only storm days. Why? Because my dad drove trucks in Army and he was stationed in Nome, Alaska! Us kids staying home was an insult to his manliness! This kind of driving scares me! Be careful out there! Wow! Everything would be closed down South under such conditions! Now see, down south, that road would close the whole county down for days! Of course, we rarely see that kind of ice and snow. This is an amazing photograph. I sure don't miss driving in that!